Dr. Atsushi Miyawaki et al. developed a water-based optical clearing reagent, Scale, which clears fixed biological samples withoutquenchingfluorescent protein. Using SCALEVIEW-A2, bodily tissues can be cleared of their opacity to provide a clearly defined image. 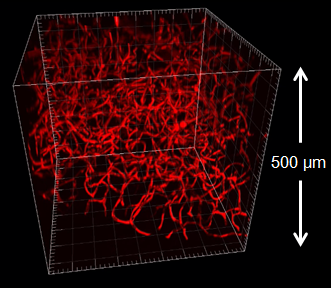 The SCALEVIEW approach integrates seamlessly with multiphoton microscopes, providing the power to visualise 3-dimensional structures at unprecedented depths in morphologically intact tissue. Optical characteristic : Refractive index ne(20℃) of SCALEVIEW-A2 is 1.377 - 1.381. 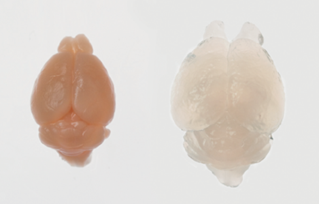 Example: Rendering mouse brain tissue transparent for deep imaging according to reference1). Transcardially perfuse an anesthetised mouse with 4% paraformaldehyde (PFA)/PBS (pH 7.5～8.0). Remove the whole brain and subject it to post-fixation in 4% PFA/PBS at 4 °C for 10 hrs and cryo-protection in 20% sucrose/PBS at 4°C for 24 hrs. Embed the sample in OCT compound and freeze it with liquid nitrogen. Thaw and rinse the sample in PBS, and fix it again with 4% PFA/PBS for 20 min at room temperature. Clear the sample by incubation in SCALEVIEW-A2 at room temperature. 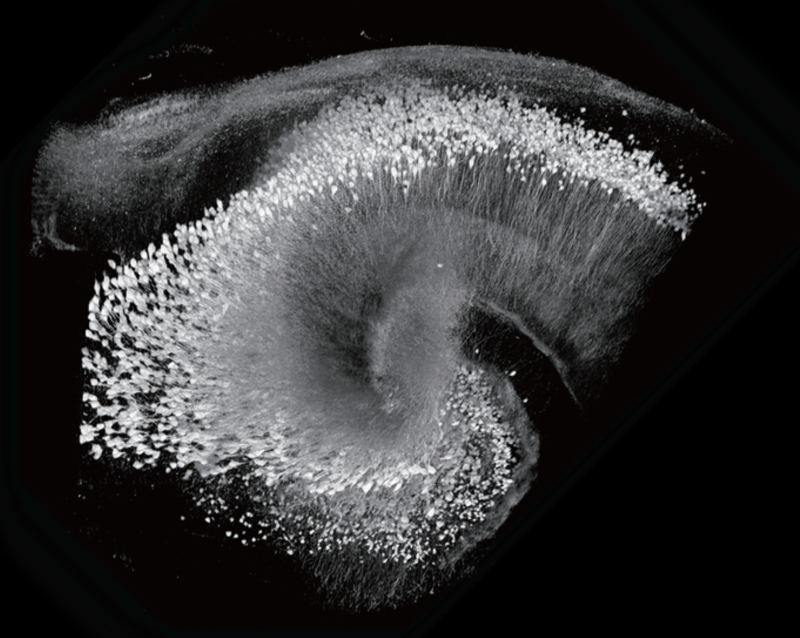 More than 30 ml of SCALEVIEW-A2 is required for an adult mouse brain. A full week of incubation may be necessary for transparency. During incubation, stir slowly using an orbital shaker. Exchanging SCALEVIEW-A2 each day accelerates the transparency process. Perform deep imaging of the transparent brain using an appropriate dipping objective lens.Use SCALEVIEW-A2 as the immersion medium. The transparent brain can be stored for a long time in SCALEVIEW-A2 at 4°C. Right: a mouse brain after SCALEVIEW-A2 process. 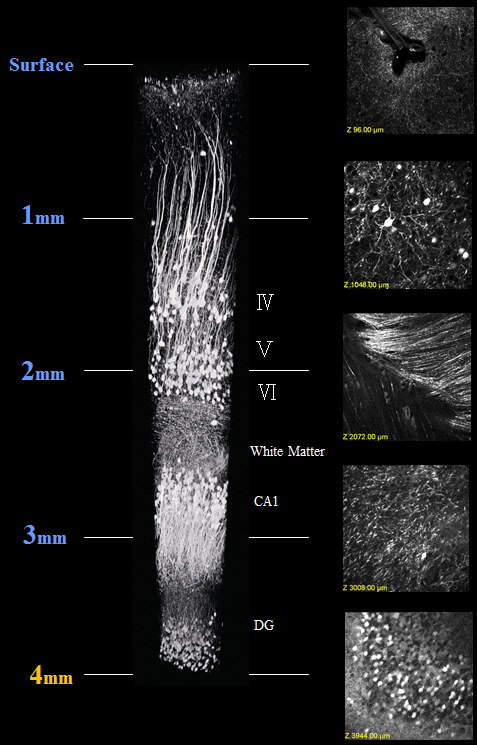 Imaging of Thy1-YFP(H Line) mouse brain after SCALEVIEW-A2 process using Multiphoton microscope and Multiphoton dedicated objective :OLYMPUS, model:XLPLN10XSVMP.Bars, 50μm. Image of mouse pancreas(labeling process the blood vessel using Lectin Texas Red) after SCALEVIEW-A2 process using Confocal microscope and objective :OLYMPUS, UPLSAPO30XS..
1) Hama,H.et al. : Nature Neuroscience 14, 1481(2011).